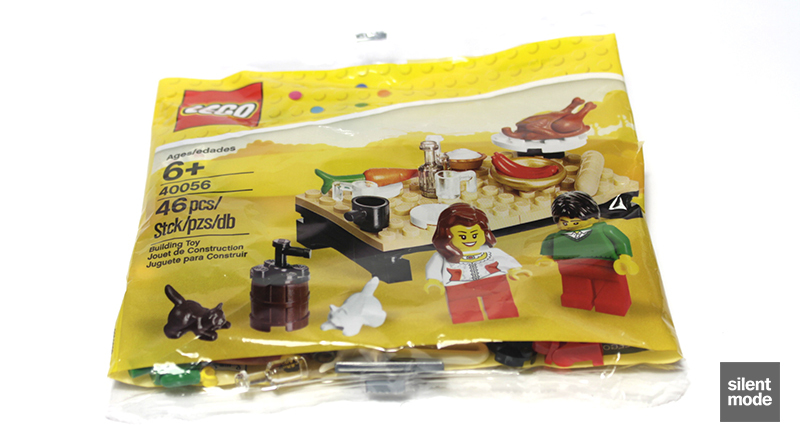 Though I’ve never experienced, nor do I have any reason to participate in a Thanksgiving celebration, I decided to take a look at this polybag set which many other people described as being a parts pack. Let’s see what we make of it! 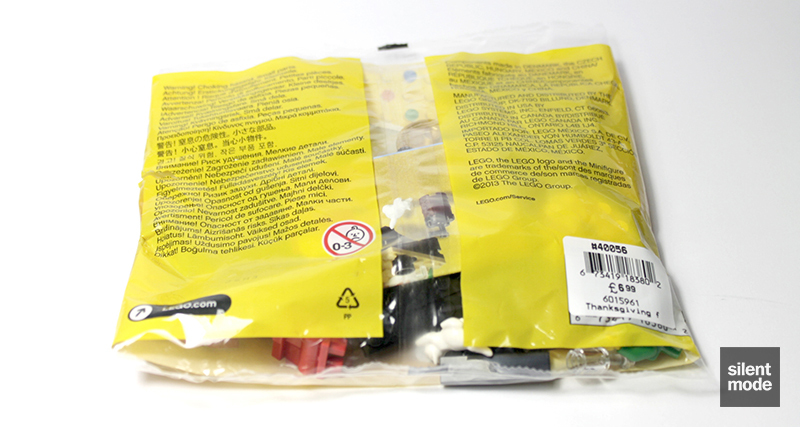 The polybag shares the same yellow background as the Fall Scene and Springtime Scene, suggesting (along with the set numbers) that it’s part of the same theme. We can also see there’s plenty of food to go around… way more than two minifigures could manage! For the rest of us, a feast of multilingual warnings about parts and safety. The only thing missing is the highlighted box, usually on the bottom left – so we have 725 languages to contend with this time. It doesn’t look like much comes in this set, and in terms of quantity there really isn’t – but the parts themselves are very nice. 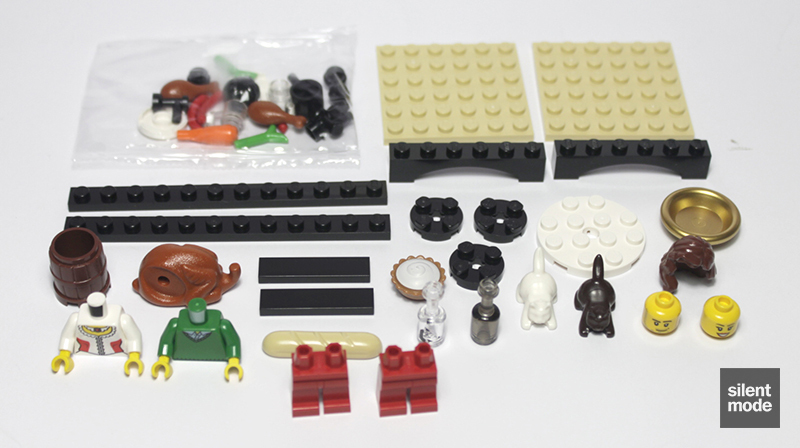 Rather unusual for a polybag set are the presence of 1×12 plates in Black, food items (the turkey/chicken, baguette and Series 5 cream pie) and two bottles, of which the transparent one has the boat printing on it (straight from the Pirates of the Caribbean theme). We also get two 6×6 plates in Tan, which will always come in useful, particularly for microscale building. The smaller bag contains a few more items, including a carrot (for anyone who doesn’t have one, or enough of them) and the missing chicken/turkey legs. The transparent mugs are useful for anyone – myself included – who takes for granted just how useful or required they can be. Again we have two minifigures in this set, and while both torsos have appeared in Build-A-Mini stations in my neck of the woods, I consider them to be on the “premium” side, i.e. not very common. Again I don’t know much about Thanksgiving, but they both appear to be dressed for the occasion, with the female looking particularly glamorous. There was a discussion over on Brickset about the fact both of them are wearing red trousers, which as far as I know isn’t traditional or has any significance. The pair are accompanied by two minifigure-style cats, and I’m wondering – with the presence of all that food – why a dog wasn’t chosen… but I suppose cats are more homely and less dependent on people. 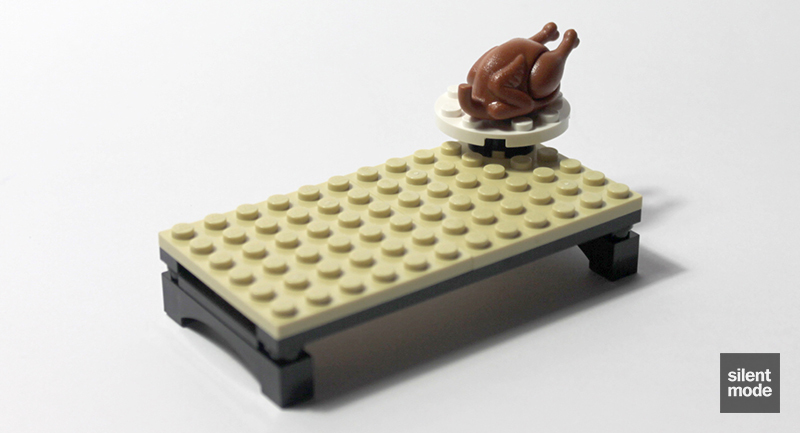 The two sets of regular plates in the set immediately get to work on building a large dinner table, as shown above. The arch pieces, as well as the other parts in Black, are used to give the table some rather unusual legs. I’m not sure if I like them or not. Not sure what happened back there, but let’s continue. The first thing to go on the dinner table is a spot for the massive turkey. To date I’ve never seen a solution for affixing one of these things to a surface, and this set doesn’t offer one either; it just sits on top. Crockery (but no cutlery) follows, with some specific points on which to place each of the elements. The finished set incorporates the rest of the items, which include some red sausages and a bottle of Jack Sparrow whisky on the table. A single carrot is placed on one of the round tiles resembling a plate, almost as if someone’s opted to go vegetarian with all that meat around. There’s also a keg of some kind, so the cats have something to drink as well. Not much at all to play around with, but all three parts are arguably useful. Again I don’t know much about Thanksgiving, but from the looks of things it’s all right as a set. I would agree with the sentiments that it’s a parts pack, namely due to the presence of food items and other useful parts, though the set is suited to being made part of something bigger (much like the Decorating the Tree set). 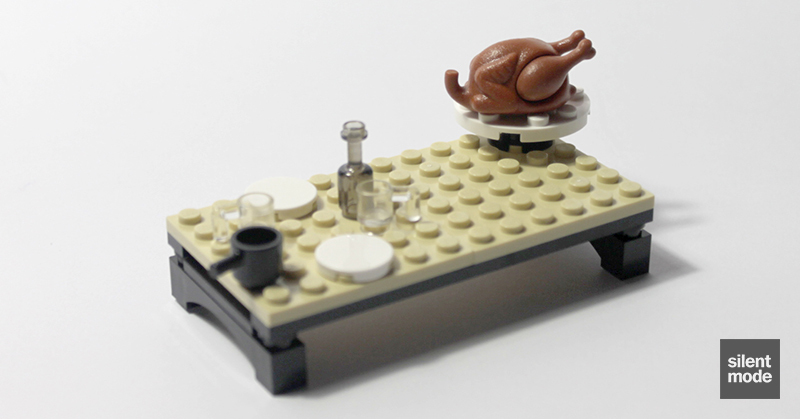 That said, the set as a Thanksgiving scene is missing a few elements. It would have been nice to have some other parts to resemble food items. I remember talking about this, specifically about Thanksgiving, with someone in a chat room, to which I suggested stacked Yellow 1×1 plates to resemble corn, and perhaps 1×1 round tiles/plates in Tan or Reddish Brown as what Americans call biscuits. As it stands, there’s a lot of meat on the table but not nearly enough vegetables… to which we could use our imagination and assume there’s something in the pot, or add some of our own elements. We could add some fish for the cats to eat, if we’re going to have cats in the set. I also think the set is missing some seats for the table: although the argument could be made that the table is just for the food, we have the plates on either side to suggest they’d be seated there – and if I recall correctly, seasonal dinners are usually eaten at the table. Most of this is nitpicking, I guess, but as a whole I think this is a very good set.. or parts pack, if you prefer. Even if you don’t like the design, it has just about every dedicated food item you can think of for the occasion. Still not sure about the technique used for the table legs, but it's something different I suppose. Kudos is given for the choice of unusual parts for a set like this. Around the same amount to build as the Fall Scene, in that many of the parts are just put in place rather than assembled. Despite the Red hips and legs, the minifigures are more appealing than in any of the other Seasonal polybags - but the food items easily steal the show. Yes, even including those sausages. Again this set is more of a display piece than something to play with, but the food items can be used for other things. The price is okay for the parts that come in the set, though you may be able to find the food and minifigure parts in Build-a-Mini sections of LEGO stores (I was able to recently). So this set gets 6.8/10 from me. Now I’m going to leave these folks to enjoy their Thanksgiving dinner.